The amphibious assault ship Makin Island (LHD 8) sails westerly through the Strait of Magellan as the ship prepares to enter the Pacific Ocean. Makin Island circumnavigated South America on the way from Pascagoula, Miss., to her new homeport in San Diego, Calif., her gas-turbine/electric drive saving $2 million worth of fuel in the process. Photo courtesy of Chilean Navy. The new Zumwalt-class destroyer is described as an “electric ship.” The next-generation carrier is more “electric” by far than any predecessor. Probably the same will be true of the coming cruiser. There has also been talk of electric (nuclear) submarines. What is happening, and why? What is so special about electric drive and electromagnetic catapults? And why is this happening right now? Electric drive was important to the U.S. Navy about the time of World War I, but it entailed a significant weight penalty, which killed it during the period of treaty limitation between the World Wars, because those treaties limited the tonnage of individual ships. The key technological considerations included the advent of new lighter-weight motors and generators, but it is also the case that ships are now so large that a bit of extra weight is of limited consequence. 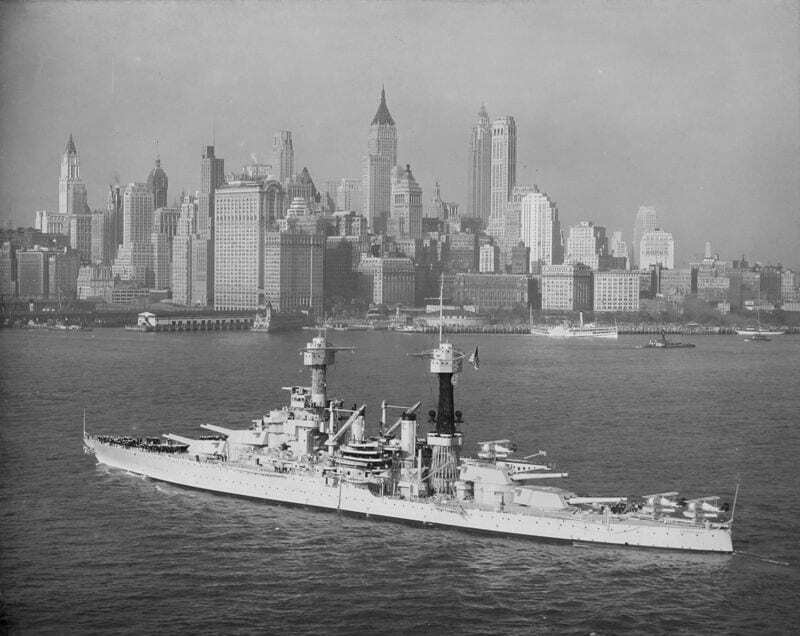 The Tennessee-class battleships – USS Tennessee (BB 43) and USS California (BB 44) – as well as the follow-on Colorado-class battleships – USSColorado (BB 45), USS Maryland (BB 46), and USS West Virginia (BB 48) – all used turbo-electric drive, although USS Washington (BB 47) was canceled due to the Washington Naval Treaty. In accordance with the same treaty, the USS Lexington (CV 2) and USS Saratoga (CV 3), both of which also used turbo-electric drive for their propulsion, were converted from battle cruiser hulls then building. The idea was revived in the late 1980s, for example, by a panel on the desirable characteristics of next-generation surface warships. It then briefly died again, because it had been applied very unsuccessfully to the nuclear submarine Glenard P. Lipscomb. However, it was revived again in the 1990s, and it has now been applied to new U.S. warship designs. The key technological considerations included the advent of new lighter-weight motors and generators, but it is also the case that ships are now so large that a bit of extra weight is of limited consequence. In each case, the ship’s prime mover drives a generator rather than a propeller shaft. The propeller (or propulsor) is driven by a motor wired to the generator. In modern cruise ships, this kind of arrangement makes it possible to place the propellers in pods, which can rotate to turn the ship – to give it unusual maneuverability for its size. In a warship, electric power in itself might have several consequences. One would be that the ship would not have to run all of her engines all the time, because electric power from any of them could drive all of her propellers. At the very least, that would make for much better efficiency and longer range at a given speed. That increased efficiency alone justified electric drive for several new major amphibious ships. USS Makin Island (LHD 8), first of the class to use a gas-turbine/electric drive, made news in 2009 for saving $2 million during her transit from Pascagoula, Miss., to San Diego, Calif. The Navy’s Lewis and Clark-class T-AKE dry cargo and ammunition ships also use an integrated propulsion system. The ships’ four MAN diesel generators serve two electric propulsion motors driving a single shaft. The first of class Lewis and Clark was launched in 2005. 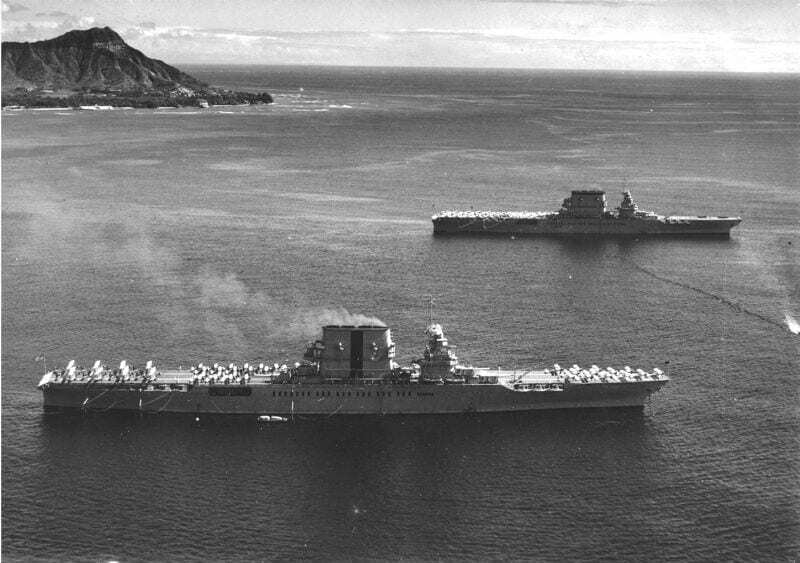 Aircraft carrier USS Saratoga (CV 3) in the foreground with her sistership USS Lexington (CV 2) in the background. Both of these big carriers converted from battlecruisers used turbo-electric drive. Naval Historical and Heritage Command photo. In the 1980s, the Royal Navy adopted partial electric drive for its new Type 23 frigates because electric drive isolated the quiet propeller from the ships’ inherently noisy diesel engines used at low speed. Because the diesel did not have to be connected directly to the propeller, it could be sound-mounted. In the past, frigates, which had to be silenced, were generally powered by relatively inefficient, but inherently quiet, gas turbines. Diesels were far more efficient, but also produced far more noise, and silencing them (e.g., by sound-mounting and hooding) was expensive and elaborate, mainly because the ships’ propeller shafts still had to be connected directly to their engines. Modern diesel-electric submarines do not have this problem because their diesels drive generators, hence, are easier to sound-mount and hood. The argument favoring diesel efficiency may become important to the U.S. Navy in a future of expensive fuel. In the late 1980s, the Royal Navy generally espoused electric drive in future surface warships on economy grounds. I do not understand how the USS Makin Island could have been sailing EASTERLY, from the Atlantic Ocean into the Pacific Ocean, through the Strait of Magellan when, in almost all cases, the Pacific Ocean is to the WEST of the Atlantic Ocean. See picture descrip-tion, immediately above, for this wording. You’re absolutely right sir. Although I changed the original caption in other aspects, that was the one thing I read right over and missed. I’ve fixed the error, and thanks for your comment. Didn’t see the forest for the trees.